Summer time and the living is easy! 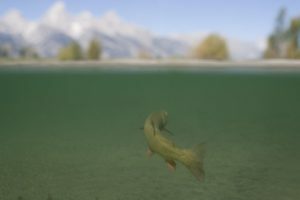 There are numerous fly fishing options in Jackson Hole as we move into the month of July. Take your pick between the Green, New Fork, Salt, and Snake Rivers or, hiking one of several backcountry creeks. This also when Jackson Hole gets busy with tourists. Fish the Fly Guide Service has the most diverse fly fishing program in the valley and we can find you fly fishing away from the crowds. The Green River and New Fork Rivers are usually in great fly fishing shape with Golden Stones, Gray Drakes, Yellow Sallies, Caddis, and PMD’s popping as flows drop. July is the best month to float fish both of these rivers. We suggest an early start, as Brown trout are light sensitive fish and are most active in the mornings. Throwing a streamer is a great way to get into a trophy trout on these early starts! The Gray Drake hatch draws a lot of attention from local anglers and for good reason. This is when every trout in these two rivers are looking to the surface for these tasty Mayflies. Cripple or Spinner patterns are the best way to see the largest trout, but a #10 Parachute Adams holds its own as well. Yellow Sallies, small hoppers, ants, and beetles keep the fish looking up through the end of the month before flows often get too low to effectively float. Our backcountry creeks really shine in July! This is an amazing time to be in the high country and fly fishing for native Cutthroat trout. The Cutthroat that live in these waters are beautiful and love to eat dry flies. Average fish size is 8-14”, but there are some big boys up to 20” feeding heavily after their spawn. If fishing in solitude in some truly wild places is your thing, then this is the trip for you! Being in good physical condition is essential, as these creeks require hiking above 7000 feet in elevation. The Salt River south of Alpine, WY clears in the beginning of the month and can provide some very fun fly fishing action for Cutthroats, Browns, and a few Rainbows. Golden Stoneflies, Caddis, and Yellow Sallies are the ticket in July. This river is smaller and its best holes are reached by float fishing. There are lots of overhanging Willows and undercut banks that hold nice Cutthroat and Brown trout. The Snake River in Jackson Hole typically clears by July 4th, but can take longer after big Winters. The Snake is a fun fishery in July for Cutthroat that range from 8-16″. The best trout are still in our tributaries in the backcountry.